We are also wondering where are all the animals. We did not see any animals at all in our entire hiking trip. We love the road signs in MacRitchie reservoir park which gives us a guideline on how much further we have to go. Remember we successfully completed the MacRitchie treetop walk earlier? Jelutong Tower is our next closest destination on the map we've shown you previously. Jolly Mäh has already been hiking for nearly 3 hours and we found this! 1. Look out for them in sunspots on the forest floor. Oh, but we found him on the boardwalk. 2. Skinks are able to regulate their body temperature and are often seen warming up in the sun. So thats what you were doing when we saw you! Jolly Mäh being extra cautious passing by a wet muddy area in MacRitchie reservoir park . A timely reminder that rainforest is the major forest type here in Singapore. You could climb up the spiral staircase to the top of the Tower to get a panoramic view of MacRitchie Reservoir Park. But after having walked 3 hours through the forest, lots of up and down wooden stairways, Jolly Mäh is too fatigue to even think about going up. The boardwalk, well I tried to type broadwalk just now *shrugs*. This boardwalk is one of the significant feature of MacRitchie reservoir. The boardwalk encircles the perimeter of the scenic MacRitchie reservoir and many walking trails through the forest. Jolly Mäh wished that there were more of these boardwalk within all parts of the forest as it would be much easier to walk on some parts of the treacherous forest trails. Jolly Mäh spotted some people at MacRitchie Reservoir fishing! What a relaxing activity to do in an evening with a comfortable weather. Other than fishing, Jolly Mäh also saw a group of people kayaking which seems quite fun! Jolly Mäh now finds a comfortable place to sit down and take a short break. Still a pretty long way to go and Jolly Mäh enjoys the fresh green air. Jolly Mäh schaf liben gras = Jolly Mah sheep loves grass in English. We're having fun learning to speak some German. Jolly Mäh then continues his journey and passes by some people playing golf. According to the map, this is the Singapore Island Country Club. It is not part of the MacRitchie reservoir park, it is just beside. Because our route is along the perimeter of MacRitchie reservoir park, we can pass right by the country club. Jolly Mäh finds a small water fountain. Say cheese! Jolly Mäh gives us a classic NICI schaf pose. Schaf = sheep, did you still remember from earlier? NICI schaf Jolly Mäh liben gras! Shortly after, Jolly Mäh walks on this beautiful trail slapped right in between the waters and there's this coconut tree in front of us that bears no fruits. Jolly Mäh then saw a signboard pointing towards the direction of MacRitchie reservoir park, Jolly Mäh is only 2.7km away from reaching our final destination. We have already spent almost 4 hours hiking. Jolly Mäh is back on the boardwalk again! This is a beautiful scenery used as one of the advertorial pictures for MacRitchie reservoir park which we've seen before. Don't be surprise to see a lot of people jogging along this particular boardwalk as it is absolutely sublime to be walking with MacRitchie reservoir on one side and trees & grasses on the other side. Upon seeing the sublime sunset scenery, Jolly Mäh sat down on a wooden bench to appreciate the sunset scenery. It is not supposed to be this dark now, just that some thick clouds were covering the evening sun. This is quite a poster picture of Jolly Mäh that we really like. What we didn't know was a surprise guest waiting for Jolly Mäh right beside and we only noticed its existence after taking this picture. Who is our special guest? Jolly Mäh did not know he was sitting right beside the green worm on the wooden bench until we saw it! But it seems like it was aimlessly crawling around didn't know where to go. This should qualify for "interesting animals found at MacRitchie Reservoir". The green worm has no leggly legs, so it was crawling in an amusing way but the speed was quite fast! Every step it crawls, it covers the whole body length. Our mirthful Jolly Mäh just can't stop looking at the green worm and we have to literally drag him away from the worm to continue on our journey back. 1km more to go but our legs can barely keep up with our body! The final 1km seems like an unending road as Jolly Mäh crosses through the bending boardwalk along MacRitchie reservoir. One thing that keeps us going is the beautiful greenery scenery around us and also, the fact that there is no other way out except going back to the main entrance of MacRitchie reservoir park where we came from. The grand finale of Jolly Mäh MacRitchie Reservoir Park adventure? A tree growing sideways 180 degrees! They even carved AHEAD LOW BRANCH on the boardwalk. This tree is not chopped down or dead, its just living its life in its own peculiar way. 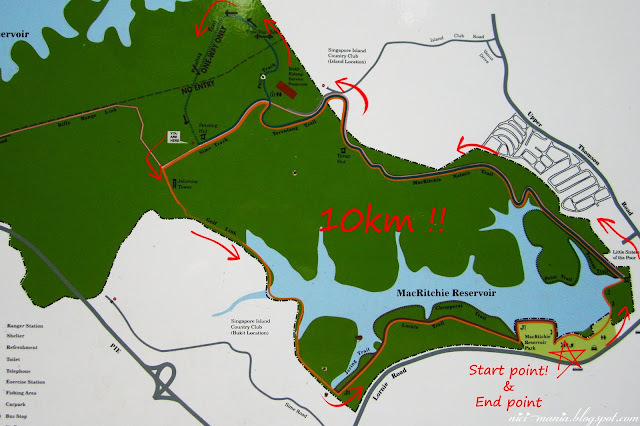 Finally we'll show you a simple illustration of Jolly Mäh's 10km journey at MacRitchie Reservoir Park on a map below. Including the extra route to MacRitchie treetop walk, Jolly Mäh's total journey should be about 11km. We did not go to the elusive zig-zag bridge as it was closed that day but you can see the pictures on the MacRitchie Reservoir Park website we've given below. Jolly Mäh is very brave to walk all these 10 km! @RaquelThanks! We have already planned our next excursion with many greeneries and sceneries. oh mine, your photos are stunning. @Bea and @myfluffy: Thanks!! We are thinking of revisiting MacRitchie reservoir again, with a better camera and more nici friends but no more 10km walk! my gosh.. seems like a super long walk!! can u remember how long it took u to walk from one end to the other? and if we drive where is a good place to park? thanks Jolly mah! !